for the SSB concept in 1961 (# 3,450,050) although his work started long before that time. 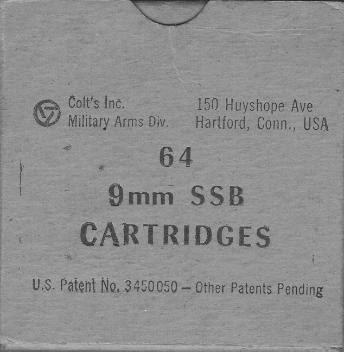 cartridge are relatively rare and it appears to have only been a test program. 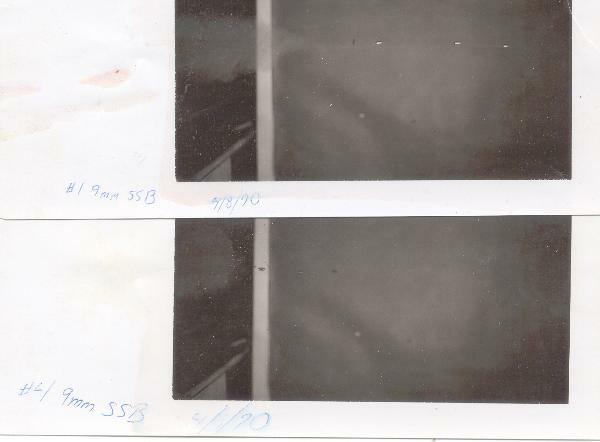 likely in late 1970 or early 1971.
and 188.5gr respectively. 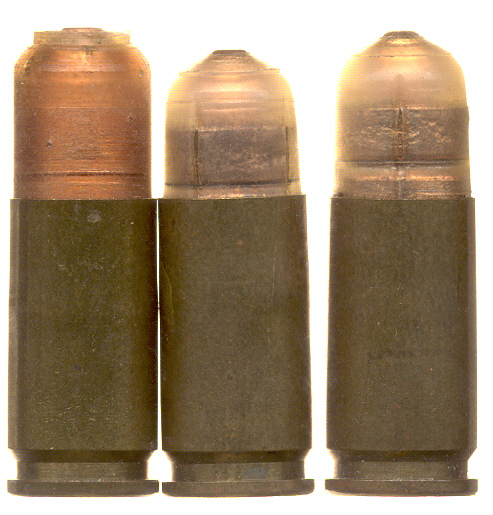 These may be triplex loads. condition (159.6gr oaw, 1.17" oal). The plastic jacket on this load is molded. (loaded by IVI of Canada) and all but about 500 rounds were shipped to Israel. 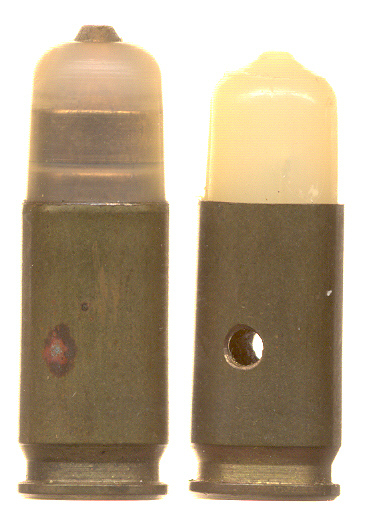 Dummy with the late model bullet which is more transparent and has the grooves or slots in the bullet. 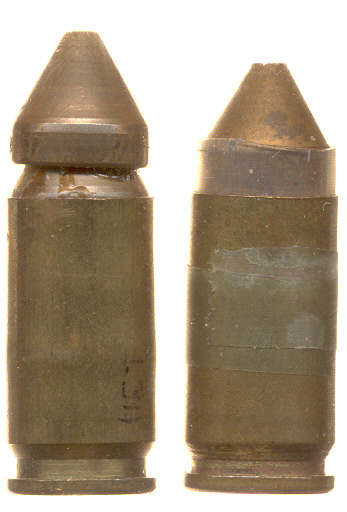 Note the rough texture of the projectiles (155gr oaw, 1.153" oal). This load has a molded jacket. 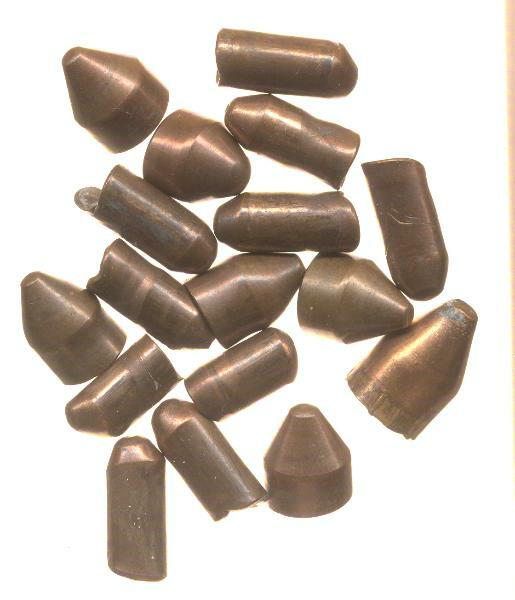 An early round with the smooth sabot and no primer (155gr oaw, 1.180" oal). Machined nylon jacket. 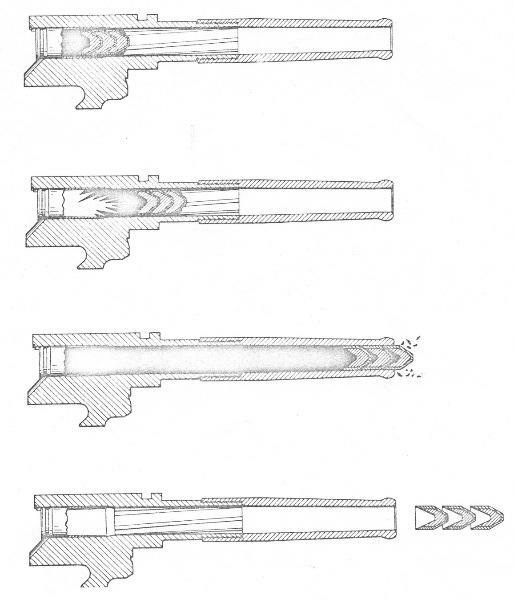 gr oaw, 1.131" oal). Machined nylon jacket. 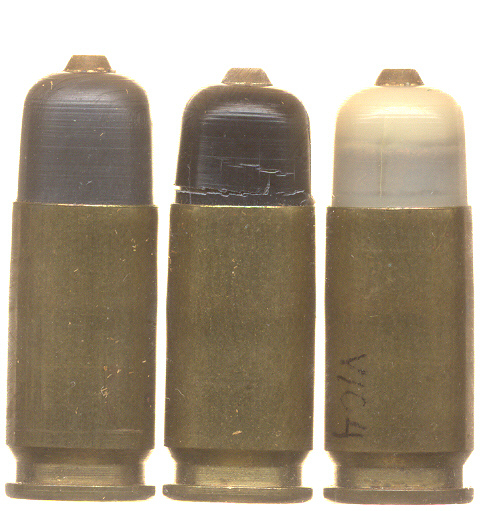 Only about 300 cartridge were made with this type jacket. 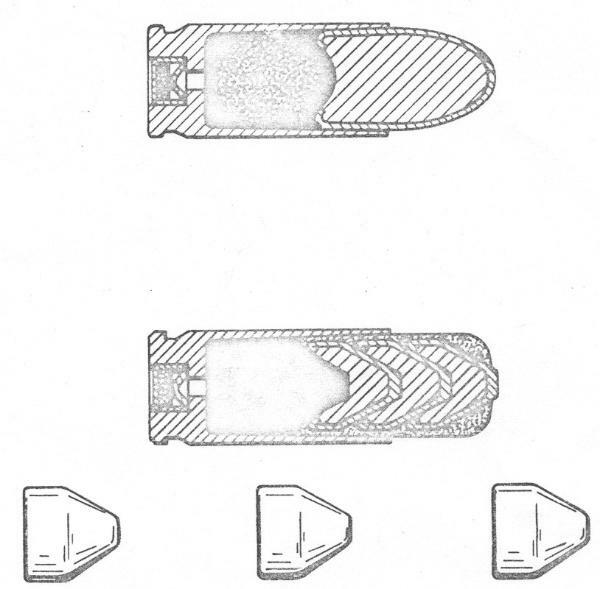 tip of the bullet. 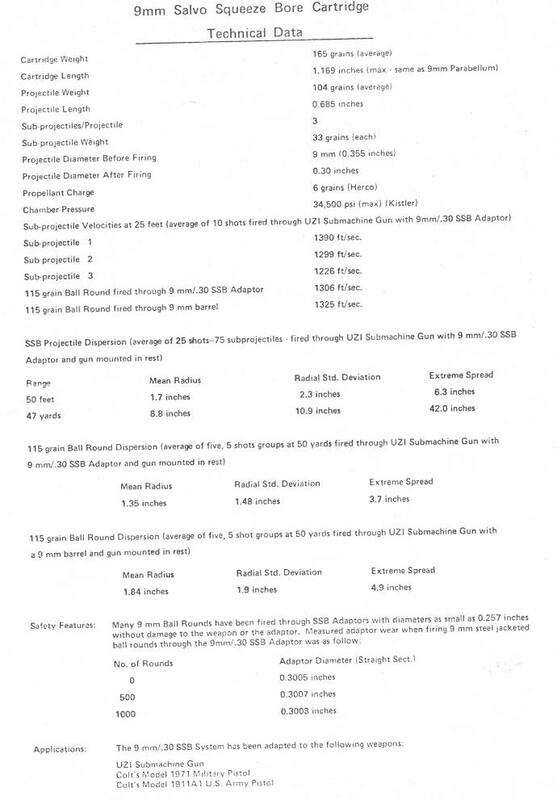 All other known SSB bullets have the tip of the first bullet exposed (164.6gr oaw, 1.149"
lack the vertical scribe marks added to later loads for better separation. All have machined jackets. 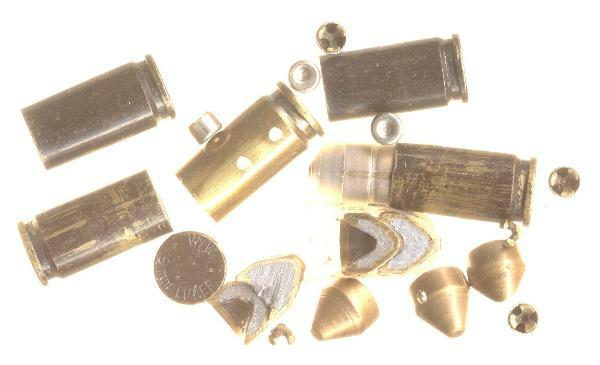 These bullets were apparently made by Colt's lab in New York using a different process. Gray molybdenum disulfide impregnated nylon jacket (164.6gr oaw). Fewer than 800 produced. The molybdenum disulfide was intended to reduce the friction. Not too successful. provide for better breakup and seperation. Not too successful. Less than 100 produced. 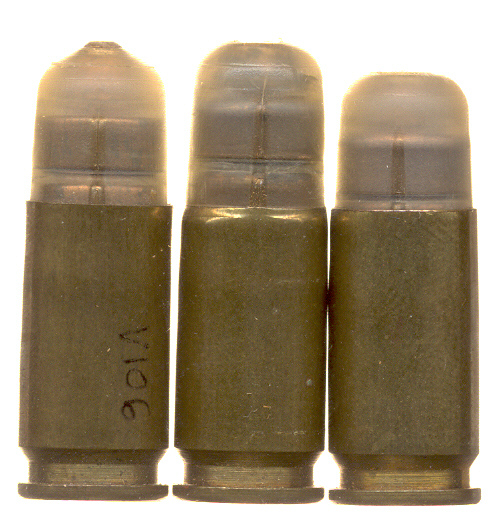 This is probably a round with an ABS plastic jacket intended to improve breakup (163.9gr oaw). 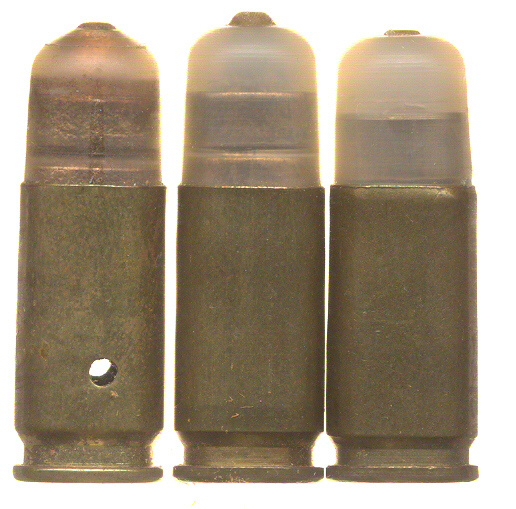 Only 100 produced, but apparently another 100 rounds were loaded with slotted ABS jackets. These three loads all have the Israeli headstamp. were made. Most were shipped to Israel. jacket, indicating it is one of the very early slotted jacket loads. and shipped back to Isreal. 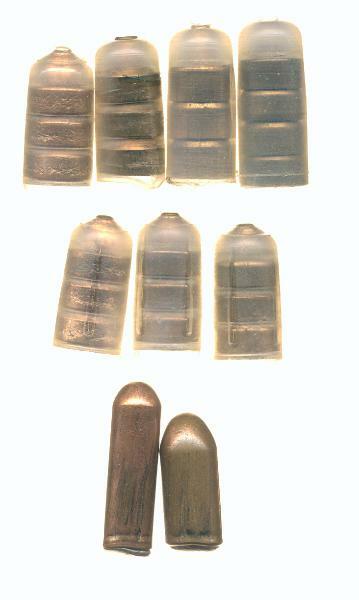 Photo of different SSB bullets with information on each. two bullets just to the right of it. 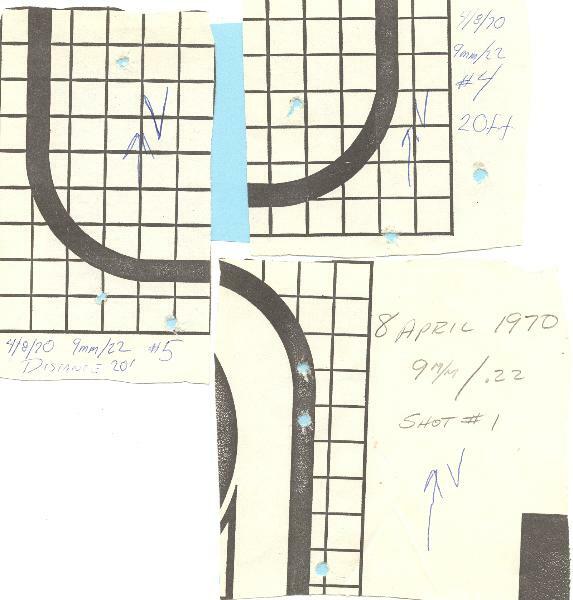 the targets was also included. 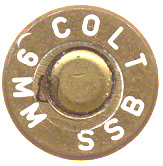 bullet is not similar to any other bullets known to be part of the SSB test series. peak pressure on the W-W shots is about 30K psi while the five SSB traces of 40K to 50K psi. 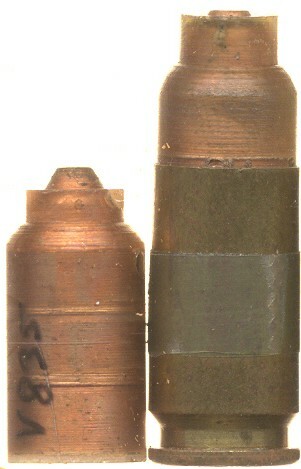 6.53mm and the other 7.64mm. headstamps. About 150 of these were made. areas. 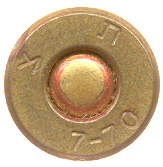 Load #3 immediately above is the only load illustrated with a machined, slotted jacket.